Formation of Rajasthan State Beverages Corporation Limited (RSBCL) was formed under the Excise Policy declared by the Government of Rajasthan for the financial year 2005-06. Under the policy, the RSBCL has been provided exclusive rights for sourcing and pricing of Indian Made Foreign Liquor (IMF) and Beer in the state of Rajasthan. The purpose of creation of RSBCL was to provide proper quality and quantity of liquor to the consumers at uniform rate through out the state. Another important purpose to remove the middlemen between manufacturers/supplier and retailers so that Government can avoid revenue leakage. RSBCL has been formed on February 25, 2005 under the Companies Act, 1956 and has commenced its commercial activities w.e.f. April 1, 2005. RSBCL has framed a Liquor Sourcing & Pricing Policy (LSP) under Excise Act for carrying out its commercial activities. All the commercial activities are carried out as per the provisions laid down in the LSP. Corporation operates its activity through 40 depots located in all districts have been established. All depots are equipped with sufficient staff and suitable IT infrastructure for running all commercial activities through online software. Some support staff for depots are outsourced. The manufacturers, both within and outside the state, keep their stocks in the Corporation’s godowns across the State of Rajasthan for distribution to retail licensees. The Corporation is collecting 0.33% margin on the IMFL/Beer sold from the depots. 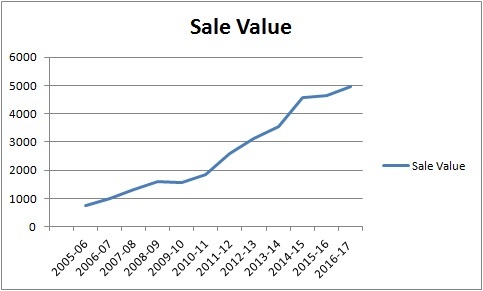 The following graph shows the sale of the corporation from the year 2005-06 to year 2016-17.